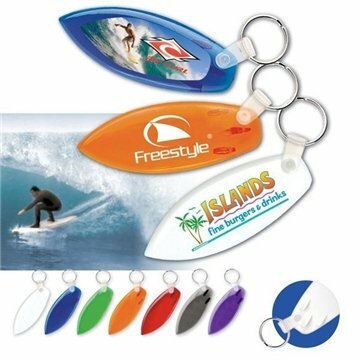 USA - made key chain looks like a surfboard, with fins. I just love the product! Everybody loved them and our logo design arrived on the scene great. We would also like to give high praise to Rosa our customer rep for meeting all our expectations in a professional and timely fashion. I like how our logo design was engraved. Loved this product. Everybody like it! Great work!! The price is much less than I expected. Liked seeing the sample with our logo on it the finished product was perfect!!!! Very neatly packed and sell ready.